Mills were vitally important to the agriculturally oriented settlements first established in Hardin County during the mid-19th century. Wheat was the chief agricultural product grown; flour was ground for domestic food use and for sale to new immigrants and other markets. Almost all roads in Hardin County before 1860 led to mill sites. Oxen and horse drawn wagons were the primary means of reliable transportation in the settlement era. The first stagecoach lines came to Hardin with the development of roads, which provided a more regular transportation and mail service. 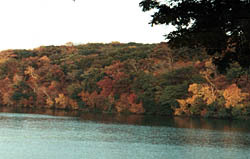 Canoes, piroques, flatboats, keelboats, and even a few paddle wheel steamboats in the lower Iowa River Valley provided substantial river traffic in the 19th century. While it was recognized that mill dams and bridges needed to be built, the major navigable rivers were avoided for these purposes, and settlements were often sited close to the mill locations. During the Civil War, growth and immigration to Iowa slowed, but the post-war period was witness to significant expansion of the stage coach and wagon roads, railroad lines and bridges. Angling territorial roads followed Indian trails or connected towns and farms to mills. However, in increasing numbers, section line county roads were laid out according to the legal township and range pattern superimposed upon Iowa by the government land surveys. This grid pattern on the landscape has strongly influenced farmstead location and field placement over time. With road access, new farms could be located well out on the prairie with square fields oriented along quarter section lines. Likewise, churches and public schools could also be located at convenient sites on the grid. The towns that ultimately prospered in the county were connected to national and international markets via the railroad. Hardin County was not among the fortunate sections of Iowa that had a railway line connected to its early settlements. 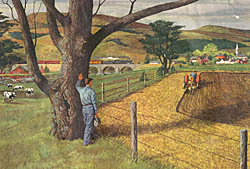 For many years, produce was hauled to market by wagon teams to Marshalltown or Cedar Falls, or some even more remote point. Ackley was constructed as the terminus of the Dubuque and Sioux City Railroad in 1865, and as such briefly became an essential shipping and receiving center for farm commodities and manufactured goods. Ackley was platted in 1857 in anticipation of a rail line but remained a paper town until 1865. The line to Iowa Falls was completed in the spring of 1866, which remained its western terminus for two more years. Historical accounts of the arrival of the railroad to small rail towns depict an atmosphere that is nothing short of riotous with railroad workers, weekend farmers, and disreputable sorts mingling in late night debauchery. In 1868 the Iowa Falls and Sioux City Railroad Company completed the line to Sioux City, thus connecting all Iowa from the east to the west. In 1870 this line was leased to the Illinois Central Railroad. 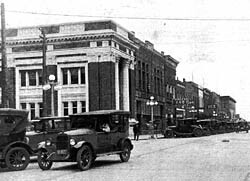 As in the Des Moines Valley, coal mining played a significant economic role in Hardin County. Local economic growth spurts were the result of prosperous mines in the upper Iowa Valley outside Eldora in 1868 and near Hubbard in the 1880s. Markets for the coal were made accessible by the construction of the Eldora Railroad and Coal Company, which later became the Central Railroad of Iowa (1869-1879), and finally the Central Iowa Railway Company. In addition to coal, building stone and clay deposits provided natural local products important to the economy. These were obtained at various places, primarily along the Iowa River. The high-grade limestone is still mined today in Alden. Other rail lines were connected throughout Hardin County by the 1880s. In 1881 the Chicago and Northwestern Railroad crossed the lower half of Hardin County, and the Burlington, Cedar Rapids & Northern Railway (BCR&N) was brought through Iowa Falls. The BCR&N heralded progress for Iowa Falls as the town became both a freight and bridge division on the road, and a 10-stall round house was built (no longer standing). E. S. Ellsworth, a prominent Hardin County businessman, built the Short Line Railway, or the Des Moines, Iowa Falls and Northern, which connected Iowa Falls to Des Moines and later Mason City. 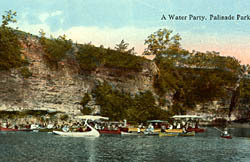 There had been a dire need for a connection to the state capital for many years, and in 1903 the Short Line became part of the Rock Island system. This was the last railroad constructed in Hardin County. Railroad passenger service continued until the 1960s. Most of Iowa's roads in the last half of the 19th century were created by township trustees who graded ditches and did some dragging of the roadway bed to form primitive grade. During this time period, few roads were graded, plans were seldom prepared in advance of work and estimates of costs were unheard of. Distances were measured by "stepping off" or "wagon loads." By 1900 Iowa had 104,000 miles of road open to travel--all rural mileage was dirt. Twenty miles of travel was a long journey for a farm team and wagon. The development of the road and highway system followed with the development of the motor vehicle. In 1904 the Iowa Highway Commission was established by the legislature, which became the Iowa Department of Transportation (IDOT) in 1975. In 1919 the state legislature envisioned a state road system of approximately 6,400 miles of hard-surfaced roads distributed among the 99 counties--officially known as the "Primary Road System." These paved roadways were especially necessary in Iowa because when it rained Iowa's rich soil became a quagmire and the state became an island of mud. Iowa's road conditions developed a national reputation that caused interstate travelers to avoid the state. The 1924 edition of the Official Road Guide to the Lincoln Highway warned "It's a folly to drive on Iowa dirt roads, during or immediately after a heavy rain. Time will not be saved by attempting it." Hardin County's road development paralleled that of the rest of the state, with the development of a Primary and Secondary system. State Highways 65 and 20 (the "Jefferson Highway") were built in the 1930s and helped many towns along the route to keep growing. As railroad passenger traffic dwindled, highways became the preferred travel routes. 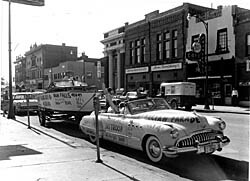 Many automobile-oriented businesses were established to cater to both the car and driver. The main north/south route through Iowa, Interstate 35, is located just to the west of the Hardin County line. The new Highway 520 (re-aligned 20) bisects the middle of the county from east to west, and is a model for transportation projects that carefully consider environmental impacts. Of particular interest is the unique bridge that carries this highway over the environmentally sensitive Iowa River Greenbelt. A scenic Hardin County drive follows the Iowa River from Alden south to Eldora with camping, picnicking and canoe launch opportunities along the way. This route, from the south western to the north central part of the county, will soon be designated as Iowa's first Scenic and Heritage By-way. It follows the old "Glacier" or "Billy Goat Highway," which originally stretched from St. Louis to Glacier Park in Montana. Many loop tours to the different towns in the county can be accessed from this route.